Pflugerville, Texas is the suburb directly bordering Austin to the North. It offers proximity to the city with the affordability of a suburb. This town with a funny name was started by the German Pfluger family when they arrived in 1849. It is very family friendly, community oriented, and a wonderful place to live (I may be a little biased, I live here myself!). The population is around 57,000, so it has the feel of a smaller town while having the amenities and perks of being near a large city. Pflugerville ISD is a highly rated school district that has done well to stay ahead of the influx of residents over the last decade. They are currently building their fourth high school and add elementary schools regularly. Many people have told me that one of the reasons they move to Pflugerville is for the schools. Dell is located on the border of Pflugerville and Round Rock and is a major employer in the area. They have created a children’s hospital in Austin and do many philanthropic events in the community. 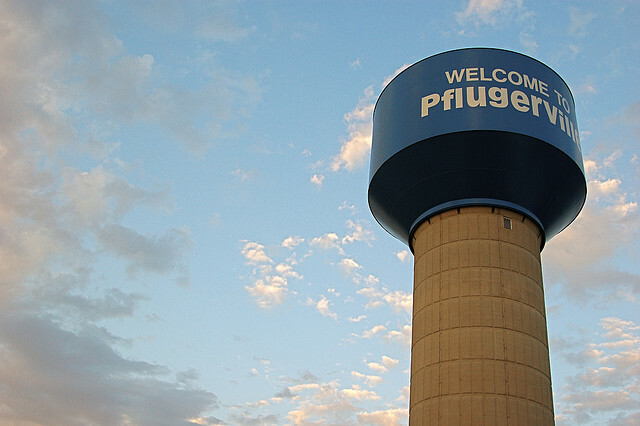 The town of Pflugerville puts on many community events every year, including Deutchenfest, Pfirecracker Pfestival, Music in the Park, Chili Pfest, and many more, usually starting the Pf is possible. 🙂 The Pflugerville library has many programs for all ages from tiny babies, to teens and tweens and seniors. It is in a beautiful new building and is contstantly offering community events like pet adoption fairs and the Makers Pfest. A Pfarmers Market is held on Tuesday’s from May through October offering a variety of fresh produce and handmade crafts. Some days they also have live music. This is held at the same location as the Scott Mentzer pool and mini watermark that offers a day of family fun for only $3 for adults and $1.50 for children and citizens that are residents. Stone Hill Town Center is located where 685/45/130 meet. It has many shopping and dining options. Ross, Home Depot, Bealls, Best Buy and way too many more to list are in this wonderful shopping center. Panara Bread, Morelia’s, Andy’s Frozen Custard, and (every parents sanity saver) Chick-Fil-A!!! are here, plus many more. And In N Out is being built right now! Hawaiian Falls Water Park is located in Pflugerville and often offers a discount for Pflugerville residents. It is the largest water park in Travis County and the zip lines are open year around. Lake Pflugerville is also minutes away. It is surrounded by a 3 mile walking trail, several fishing docks, playground, pavilion, and beach area for swimming and barbecuing. Every year there is a triathlon that uses the lake for the swimming portion of the race and every Fourth of July there are fireworks over the lake. In addition to all this, you can rent paddle boards and kayaks or bring your own! My kids love to visit the lake all summer long. I, personally, love living in Pflugerville and I would love to make you one of my neighbors! If you have any questions or would like to start looking for homes in Pflugerville, contact me anytime!